Let’s start off by acknowledging that I detest over-generalizations and “umbrella cures”. What does this mean? It means that there are various causes for similar syndromes, so while massage may be beneficial for many depressed and anxious patients, it will not be the cure-all for everyone. Now that my disclaimer is out of the way, let’s discuss our brains. While the initial creation of our physical brain is based on genetics, our life actually alters its shape. This is the neurological foundation behind “practice makes perfect”. As we practice something – be it math, science, hockey, or dance – the neurons in our brains are assisted by astrocytes and oligodendrocytes to create new axon pathways: New “shortcuts” in our mind. With more shortcuts, we gain a tendency for that particular activity to become second nature or habit for us. Many people see this and agree, to some extent, that it all makes sense. For whatever reason, most people leave this phenomenon of the brain right there: With sports and such. Why not with emotions? The reality is that similar pathways in the brain, which control everything else, create an emotion; so yes, you can edit your emotional self as well. Just as with anything else, it takes hard work, dedication, and the acceptance that change will eventually occur. No one lifts weights without expecting to eventually see their muscle tone change, right? The first step that you can start with right now is to use positive affirmations. The easiest way to do this is to ask yourself, “What are three things that I feel crappy about right now?” Let’s say that you feel tired, unhappy, and have no confidence. Write them down, then write their opposites next to them, and repeat to yourself, “I am energized, happy, and confident.” It may seem cheesy, but with repetition and experiencing (imagining) the positive emotions, it works. The next step is training your brain to be quiet, accept things, and embrace endorphins at a natural rate. Many clinically depressed individuals are so because their brain will not produce the level of endorphins required to achieve a sense of happiness or contentment. (Remember, many, not all). Massage therapy jump-starts the production of many “happy hormones”, including oxytocin and endorphins, and gives us a sense of peace. The reasons that massage provides this benefit for us are numerous, so I won’t go into detail here, but it is also worth noting that massage decreases cortisol levels. Cortisol is a stress hormone which is great for fight or flight situations, but completely unnecessary during the typical day. Cortisol increases heart rate, increases blood pressure, and creates blood sugar imbalances just to name a few unfavorable traits. Adopting a lifestyle which incorporates frequent massage therapy sessions, as well as meditative yoga (to learn how to experience thoughts and emotions without accepting every one of them), can lead to a content lifestyle: Which is what many people believe should be our goal. Accepting that life is just life – and it is never good or bad – simply life with some pleasant or unpleasant isolated instances may be one of the healthiest ways to go about your days. Speak with your psychological healthcare provider first, and then come visit me for a massage. After your first session, we’ll evaluate how you feel and decide on a regimen that will work best for you and your wallet. You may want to begin intensely, with a massage or more per week, and slowly taper off to naturally fitting monthly routine designed just for you. Contact peteatkaya@gmail.com with anyway questions, comments, or concerns. Pete Lerza is the Spa Manager at Kaya Wellness & Yoga in Rehoboth Beach, DE. 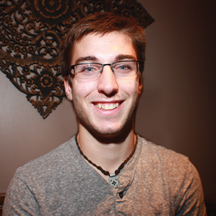 Pete is a Licensed Massage Therapist, Certified in Holistic Pathology. Pete also serves on the Program Advisory Committee at the Dawn Career Institute. He takes a holistic approach to helping you relieve yourself of the physical and emotional stresses of everyday life. Primarily practicing Swedish & Deep Tissue Massage, and having a strong understanding of the nature of “knots” & general wellness, Pete strives to help his clients enjoy a better quality of life. Pete uses the knowledge from his certification in Holistic Pathology to address complaints of pain with various techniques & perspectives. For more information or to schedule an appointment, visit www.KayaWellnessCenter.com or www.PeteAtKaya.com or call (302) 227 – 3450.